I knew I wanted to try this at the show. Karuizawa. A name some will never have heard of, others start to drool at it's mention. Karuizawa. A distillery built by a volcano. Some say the Macallan of Japan. Karuizawa. Men have lost themselves in it's Sherried depths, others have gone mad searching for those Noh bottlings. Karuizawa. A name I won't soon forget. This cost me 4 dream drams (£40) but that's pretty cheap for an early 80's Sherry Karuizawa. 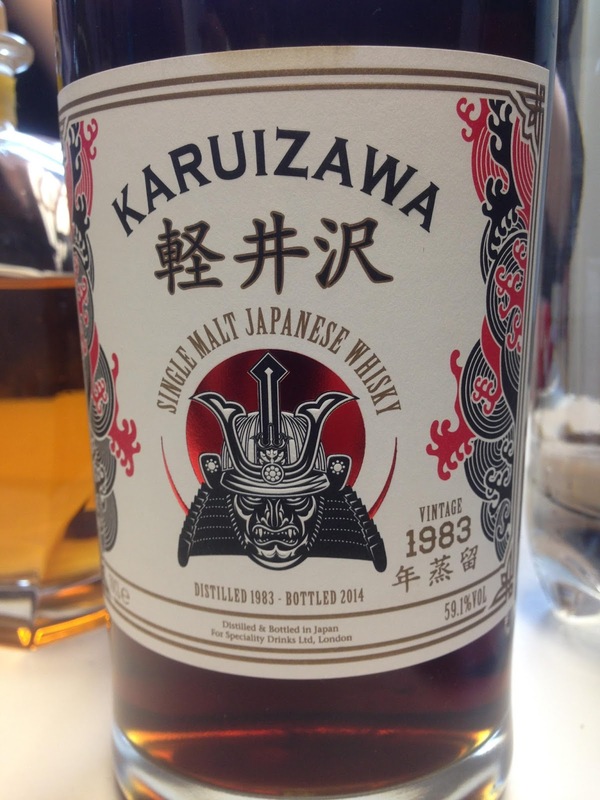 This was a private bottling by Number 1 Drinks Co. (who own the Karuizawa stocks). I got this at the scotchwhiskyauctions.com table. Nose: Dark and brooding. Earthy Sherry, some vanilla, sweet figs, dates, a little meaty, complex spice. Really complex. Water: More complex (if that is possible! ), wood and spice integration, more earthy, forest floor, autumnal, a beautiful black cherry note. Taste: Mega. Sweet and complex, figs, raisin, spices, huge Sherry, really rich, mouth watering, cinnamon, ginger, wood spice. Water: Softer but huge still, more paced out and longer development, long Sherry and stewed fruit, earthy, goes on and on. Chewy. Finish: Long length. Sherry, spice, little oak, dunnage. Water softens with more soft spices and dunnage wood, oak. Hugely complex, integrated, balanced and powerful. Maybe not worth the huge prices these are fetching, but at least I know why now.